The development of the multi-agent, holonic, and secure platform in MAS2TERING is the main focus of this deliverable. This platform aims at providing an integrated platform for distributed management of the Smart Grid, based on multi-agent systems. Such platform shall allow the optimisation of generation, storage and distribution, and upgrade the grid with self-healing capabilities, which will be the focus of the deliverable D3.3. This platform will be closely integrated within the high-level grid architecture, provided in the deliverable D2.2 from WP2. This document is based on the use cases defined in Deliverable D6.1, and the Universal Smart Energy Framework (USEF), extensively studied in the deliverable D1.6 and with which MAS2TERING project aligns. The specification is performed following the GAIA methodology, whereas the implementation is performed using the GAIA2JADE process; i.e., we devise the multi agent system, using the JADE framework, based on the GAIA models from the analysis and design phases. Universal Smart Energy Framework (USEF) is a reference framework for market design, actor interactions and common flexibility services between the actors. Since MAS2TERING aligns with USEF, the data model, the agent types and their roles have been identified and specified based on USEF’s specifications. These agents are: Device agent, Customer Energy Management System (CEMS) agent, Aggregator (AGR) agent, and Distributor System Operator (DSO) agent. MAS2TERING defines three use cases in the deliverable D6.1, which will be used to validate the solution based on multi-agent systems. The first use case focuses on home-level optimisation, including the interoperability and the connections to handle requests/connections to the flexibility market via the aggregator. Agents involved in this use case are the Device agents, and the CEMS agent. The second use case deals with the local management, at the district level, by involving the AGR, which communicates with the CEMS agents deployed in the houses of the local community. The third use case extends the previous use case since it considers the entire low voltage power grid as the union of many local communities in a given area. This is performed by involving the DSO agent, which communicates with the aggregators to negotiate the power plans and to inform the congestion points of the power grid, if any, and consequently procure flexibility for congestion/capacity management. GAIA methodology, which has been applied in deliverable D2.2, is also followed in this deliverable to complete the development phase. GAIA starts at the analysis phase by collecting the specifications of the multi-agent based system. It identifies the global behaviors of the system, the roles model that captures the basic skills required for each type of agent, the interaction modes that captures the needed interactions based on the previous roles, and the rules, which are the constraints on the execution activities of roles and protocols. The analysis phase of GAIA produces a preliminary roles model, a preliminary interaction model, and a set of organizational rules. Then, the design phase in GAIA aims at producing the complete specification of the MAS following these four sub-phases, namely: definition of the overall organizational structure, considering the adopted organizational structure to update the role and interaction models, the definition of the agents models by specifying agents’ types and their instances, and the definition of the services model that defines blocks of activities with their conditions related with the agent roles. Finally, GAIA2JADE provides the process to develop the specified agents, roles, behaviors, services, and protocols in JADE. Figure 1 illustrates an overview of this deliverable. This deliverable aims at providing the specifications and the implementation of the data model, the constraints, the agent model, and the behaviors of the agents. We first provide the background of our specifications by briefly describing the agent types identified based on USEF, the use cases, the followed methodology, and the MAS platform where our solution has been developed. Then, the core of this document provides the smart grid data model, the agents and their behaviors, and the constraints and objectives of the agents and the smart grid devices. The deliverable is completed with deliverable D5.3 and D5.4 where the communication aspects of the agents are studied. A research paper, based on this deliverable, has been presented at CASE special session in IEEE Smart Cities conference. The paper also includes some contents regarding communication from D5.4, and is attached as Annex in this deliverable (Annex C.1). One of the main results from WP2, and in particular in deliverable D2.2, is the decision of using GAIA as a methodology for designing MAS2TERING agents and the use of Java Agent Development Framework (JADE), as a framework for implementing them. In this deliverable, we apply the GAIA2JADE process to convert from the identified models into the real MAS implementation. GAIA is a methodology for the analysis and the design of the multi-agent systems [2, 1], whereas JADE is an open-source software platform developed by Telecom Italia Lab (TILAB) in Italy, and distributed under the terms of the Lesser General Public License (LGPL). JADE is a middle-ware (written entirely in the JAVA language), which simplifies the implementation of multi agents by providing a set of graphical tools that support the debugging and deployment of agents. More information on JADE can be found in . Another advantage of combining the GAIA methodology and the JADE platform is the large amount of research and work in the literature that focuses on mapping from one to another; i.e., there are few works that studied how to translate the GAIA model to the JADE platform, in the so-called GAIA2JADE process [1, 4]. This is achieved by specifically focusing on the JADE platform in the design phase, whereas the designer can move straight forward towards the implementation, without having to adapt the results of the design phase. We follow the GAIA2JADE process for implementing the GAIA models, which are defined in D2.2 using the JADE framework that is chosen in MAS2TERING as underlying MAS platform. The GAIA2JADE process aggregates four process packages. In this deliverable, we focus on the JADE implementation process. This process involves the developer role and produces two products (i.e. outputs of this deliverable), namely: the Java code and the repository of behaviours. Notice that JADE behaviours are reusable pieces of code (components) that can be used for building agents or other complex behaviours. Link the defined agents with their behaviours. For this purpose, the developer shall use the setup method in the Agent class by invoking all the methods (GAIA activities) that are executed only one time at the beginning of the top responsibility. It also initialises all agent data structures and adds all behaviours of the lower level in the agent scheduler. 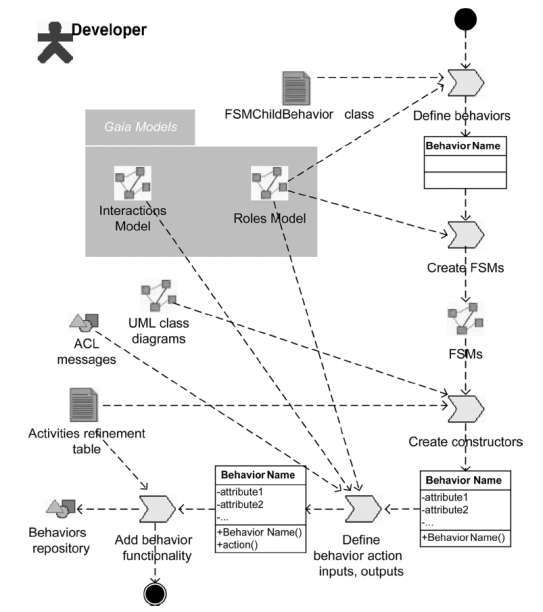 Activities and protocols can be translated to JADE behaviours, to action methods (which will be part of finite state machine – FSM like behaviours) or to simple methods of behaviours. Figure 3 – GAIA2JADE definition of JADE behaviors and agents implementation process . This deliverable defines the activities refinement table, including application-dependent data, their structure and the algorithms that are going to be used by the agents are defined. Then, we define the JADE behaviours and the agent classes following the corresponding GAIA2JADE process illustrated in Figure 3. This deliverable provides a first version of the implementation of the multi-agent and holonic platform for MAS2TERING. To extract the requirements and for the analysis phase, our deliverable was based on the USEF framework described in deliverable D1.6, with which MAS2TERING aligns, and the use cases defined in deliverable D6.1, which will be used to validate our proposal. GAIA methodology, which has been adopted in deliverable D2.2 as agent development methodology, has been also used in this deliverable. Furthermore, the MAS platform, defined in deliverable D2.2 has been also used as the base for the implementation of the identified agents, their behaviors, and their constraints. As for the Smart grid model, this deliverable presents a MAS2TERING common data model in order to allow the common expression of information exchange between agents. 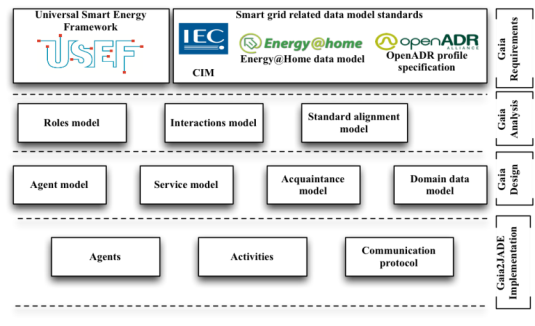 It also details the alignment of this common data model with the three identified standards for use, namely the CIM standard for modelling the electrical domain, the OpenADR standard for modelling demand response within the Smart Grid, and the Energy@Home standard for domestic conceptual modelling and their relevance for the different use cases. As for the agents, this deliverable details the implementation of the four types of agents that have been defined inside the Agents Model component, and that will be instantiated in the project use cases that are specified in the deliverable D6.1. These agents are the Device agent (with its seven subtypes depending on the type of flexibility provided), the CEMS agent, the AGR agent, and the DSO agent. Each of the subtypes of the Device agent has its constraints and objectives, which have been specified and implemented in this deliverable. The communication protocols between the agents are defined in deliverable D5.3, and will be implemented inside the Communication and protocol component (as part of D5.4), whereas the security aspects studied in deliverable D4.2 will be implemented inside the Security component of the MAS platform. This deliverable is accompanied by the first version software implementation of the specified agents and their behaviors in this document. The following deliverables in this work package shall focus on designing and implementing the Forecasting algorithms and the optimisation protocols in order to be integrated into the agents, completing the MAS implementation phase.